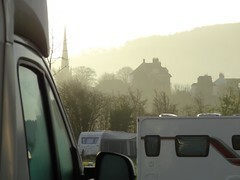 It is with real sadness that I leave Monmouth campsite; a sadness that is, I think, the lot of a traveller. Not the debilitating sadness of regret, of life unlived, but the positive, rich sadness of a joyous time complete; if life were always filled with such sadness we would be so much happier. Although the van has been camped here for over a week, I have had just two nights, and yet in that time felt such a warm welcome, that I feel there are real friends here. I am sure there are terms in sociology for communities such as this. These are people with homes elsewhere, but who live large parts of their time here, in ‘touring’ caravans that have gardens and lights set round them. Pat lives in Staffordshire and feels she has to go home (or maybe make a trip home) as washing is building up and her washing machine back there is cheaper than the launderette. Yet clearly, this is her life, her ‘home’ too. Offa’s Dyke takes us back to the Dark Ages where Saxon and Celtic British were still vying for the land. Yet this community takes me back to earlier times, 10,000 years ago, when only a few thousand Neolithic tribes roamed the lands. They must have gathered periodically, meeting and re-meeting old friends, spending time together around cockle beds, or hunting grounds, before separating for periods each in their own territories, scavenging the land. As I set off to CHI I realise that the academic community too has many of the same features, although shorter periods together than those staying semi-permanently in caravans, a periodic meeting and re-meeting over years, like seasonal hunting camps. Indeed many of my own closest friends are those I have met in such a way. Often the total time spent together is short, but the moments are intense and over long periods. Haliyana and I write about ‘extended episodic experience’ and the way these moments build to give an overall experience that is far more than its parts. So let there be more such sadnesses as this, the sadness of the passing of moments of joy, rather than the absence of joy. The death that is always in life, not the death that is the end of life, but the death of the passing moment, the death of the leaf falling to give fresh life to the forest, the death that is the resurrection death, that makes each moment the beginning of new life.